Can I just tell you that this dish is the bomb!!! I made extra so I can eat it again a few more times. And it’s easy to make. I got this idea from a recipe on the Whole Foods website. And I made some tweaks just to simplify the process. It’s delicious with pasta. I also had it with polenta and it’s just as good. So, do yourself a favor and get cooking! Pour flour in a wide bowl, season with salt & pepper and whatever dried herbs you have (tarragon, thyme, basil, etc.). Dredge veal pieces to lightly coat, shake excess flour and pan-fry with a little olive oil in medium heat. Turn once, cook no more than 5 minutes total. Set aside, cover to keep warm. In the same pan, add more oil and 2 tbs. of the excess seasoned flour, cook for a couple of minutes. Now, add 1/2 cup of the stock and stir until bubbly and thickened. Add more stock, if needed, until a gravy consistency is achieved. Whisk in the butter until melted, then turn heat off. Mix in the parsley and capers. Squirt the juice of 1/2 lemon. 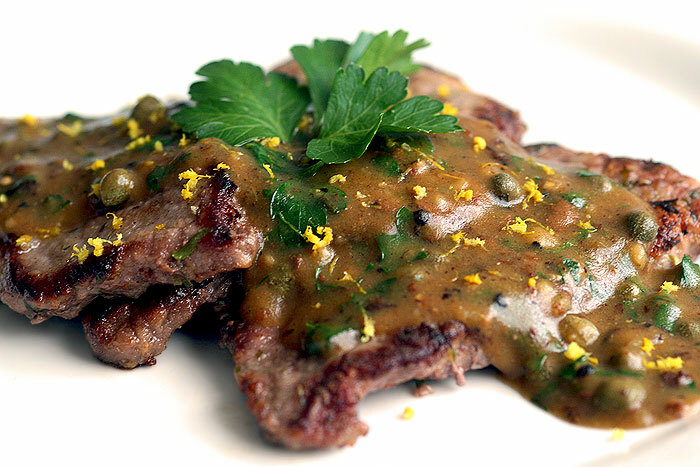 Place the veal pieces on a plate and smother with gravy. Garnish with lemon zest, more parsley and a lemon wedge. 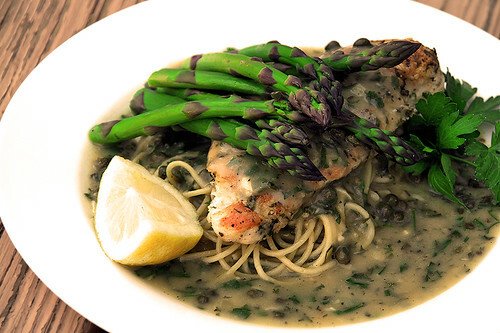 Serve with pasta, polenta or egg noodles. and parsley with a glass of Sauvignon Blanc.